An emaciated dog found Friday in Bandy Canyon remains in critical condition but has shown some signs of improvement, the San Diego Humane Society’s animal care staff reported Monday. A county resident brought the 2-year-old male pit bull mix to the Humane Society’s Escondido campus after finding him extremely dehydrated and cold, with pressure sores on his hips and knees. Humane Society veterinarians are working to feed and rehydrate the dog slowly so as not to damage his body in its current fragile state. According to the organization, it could take between seven and 10 days for the dog to turn a corner and begin to recover. Humane Society staff are hopeful that will happen. 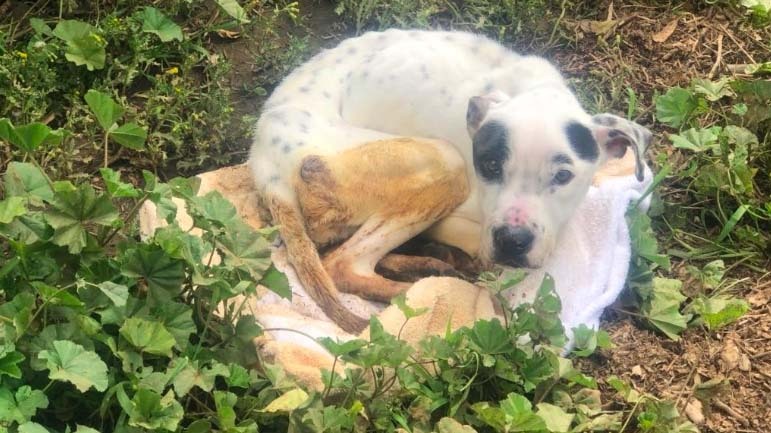 The organization’s Law Enforcement unit opened a felony cruelty investigation on Friday into the dog’s abandonment and who may be responsible. Residents can offer information leading to the responsible party’s arrest by calling Humane Society Law Enforcement at (619) 299-7012. San Diego Crime Stoppers is also offering a $1,000 for information leading to the person’s arrest. Residents can call the Crime Stoppers anonymous tip line at (888) 580-8477 or visit the organization’s website, sdcrimestoppers.org.